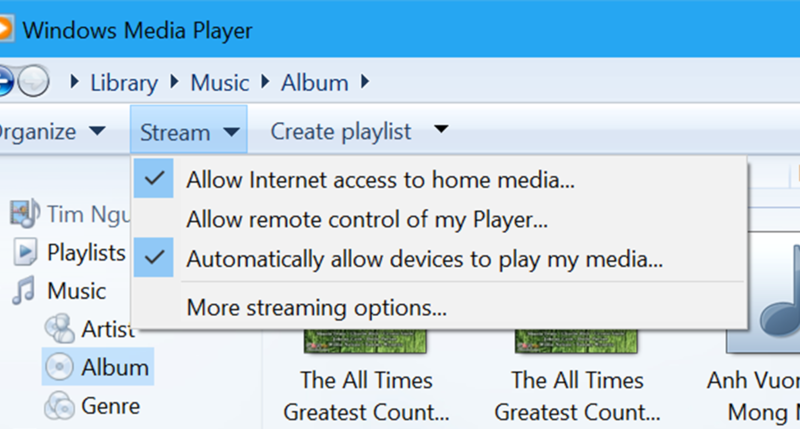 Khởi động Windows Media Player 12 trên PC. Chọn “More streaming options...” trong “Stream”. Chọn “Allowed” trong ô cho “Denon DRA-100”. Chọn “Allowed” in the drop-down list cho “Media programs on this PC and remote connections...”. Start up Windows Media Player 11 on the PC. Select “Media Sharing” in the “Library”. Click the “Share my media” check box, select “Denon DRA-100”, and then click “Allow”. As you did in step 3, select the icon of the device (other PCs and mobile devices) you want to use as a media controller, and then click “Allow”. Change settings on the Network Attached Storage (NAS) device to allow this unit and other devices (PCs and mobile devices) used as media controllers to access the NAS. For details, see the owner’s manual that came with the NAS.